There are a number of factors to consider when working to properly and completely dry out a property suffering from a water damage incident. This a job that requires the expertise and equipment of professional water damage restoration services. Here is a list of considerations. Penetrating and non-penetrating moisture meters, thermo-hygrometers, and hydro sensors determine relative Humidity and Severity of Damage. Optimal drying temperature must be maintained to ensure timely drying. Calculated with a psychometric chart. The fewer grains per pound of moisture in the air the faster the structure will dry. Refrigerant, low grain refrigerant, and desiccant dehumidifiers are used during the drying process to reduce the amount of moisture in the affected area. Air Movement: Crucial in speeding the drying process. The amount and placement of air movers is essential during a dry out. The use of the HVAC system and ceiling fans is also helpful. Wall or ceiling cavity drying systems and floor drying systems including drying mats. In case of non-fresh water sometimes referred to as “gray” or “black” water, such as washing machine or dishwasher water, toilet bowl water, or sewage. A sewing factory had its roof blown off during a severe storm. It was going to take several weeks to replace the roof on the factory, and the owners were concerned about two specialized sewing machines totaling $200,000 that were exposed to rain and wind during the storm. They were too heavy to be moved, so their professional restoration service placed a special containment around the two machines with drying equipment to maintain the humidity inside the containment while the roof was being replaced. The expensive machinery and the factory offices were saved thanks to the ingenuity and willingness to take on a drying challenge. A 4000 square feet house was severely water damaged due to long-term crawl space saturation. The frame and floors were all wood that had been wet for several months. The wood was warping so badly that the kitchen cabinets were beginning to detach from the walls. TCM managed to save every board foot of the home and return all the wood to its original condition. The fire suppression system of a manufacturing plant burst and flooded the building with 250,000 gallons of water. The force was so powerful that the water cracked and floated the concrete 10′ slab floor. Water damage restoration crews worked all night Saturday and all day Sunday. The factory was ready for business Sunday night. All the walls, carpet, and contents were saved. First let’s start with its use. A pitch pocket is used on both sloped and flat roofs to provide a water-tight seal around columns or other roof penetrations. On traditional installations, metal boots or pipe sleeves are used for water-tight protection but often a specialty flashing is required, this is also called a pitch pocket. A pitch pocket is usually made from sheet metal such as aluminum or steel and is fitted around the rooftop penetration to protect the roof from moisture. Any type of flat roof penetration can compromise the integrity and weather-resistance of an entire roof. These openings can allow moisture to get into the insulation and framing below the roof membrane which can lead to rotting, mold, and other roof problems. Whenever a penetration or installation is made on a flat roof, metal flashing and counter flashings are installed. A traditional pitch pocket resembles a top hat with an open top and bottom. 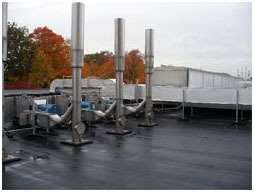 The flanges at the bottom of the pitch pocket are fastened to the top of the roof structure with vertical sections that are fitted around the unit, pipes or other rooftop equipment installed on the roof. The open seam is aligned using built-in connectors or grooves. Houston Roofing Contractors usually build and install custom pitch pocket models which will require welding or special adhesive to ensure a water-tight seal. Some pitch pockets models can also be hammered together using an interlocking seam. Coal or tar pitch used to be the material of choice to seal equipment to the roof decking which is where the name “pitch pocket” comes from. Currently, hot asphalt or grout is poured into the top of the pitch pocket to form a tight seal. Filling in the gaps between the base of the pocket and the roof is what prevents water from leaking into the roof so a roofing expert must know the right material to use for each different type of roofing system. 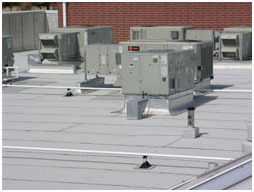 Roofing Contractors also install rooftop equipment as well as pitch pocket installation afterward. They should understand that a pitch pocket is not designed to prevent shifting or movement of a rooftop object; the rooftop equipment must be installed properly first. If it is deemed necessary due to the rooftop equipment or age of the roof, a storm collar or other type of counter flashing can be installed to ensure there are no roof leaks. A storm collar is fitted tightly around the protruding pipe and extended out the base covering the top of the pitch pocket. Cost-effective flat roof replacement requires careful planning. For a Houston commercial or industrial flat roof replacement, there is no universal standard solution – every measure must be individually planned and object-based. No flat roof replacement is the same the last one, each project requires special demands on planning and execution. The flat roof replacement methods required depending on the investigation, evaluation and detailed planning. For a successful commercial industrial flat roof replacement, detailed examination of the roof area on site with subsequent damage analysis is essential. Before the replacement of your flat roof, a site inspection is required and an individually tailored flat roof replacement plan should be completed. Professionally planned flat roof replacements begin with determining the state and condition of the current flat roof. Only when the construction and condition of the flat roof are known in detail, a decision on the remedial measures can be made and carried out. If you think your industrial or commercial flat roof Houston may need to be replaced or re-roofed, a thorough thermo-graphic infrared roof inspection should always be the first step. Many contractors will immediately recommend a completely flat roof replacement because they cannot source the leaks. An infrared inspection should be a priority before any work begins. Houston, TX commercial, and industrial flat roofs are replaced prematurely due to the lack of proper investigations and maintenance. As your flat roof ages, leaks and repairs will become more frequent. Don’t give father time and mother nature a chance to catch up to your flat roof. Some contractors offer a Free Annual Roof Inspection Program. This will ensure the small problems will be found and taken care of before they become the source of a major expense. Before your flat roof completely breaks down, you have the choice: either recover your flat roof or replace it now before you have no choice in the matter. In many instances, flat roof recovery might seem like the best option simply because it’s less expensive. That’s because there are more materials and labor involved in a replacement. In some cases, recovering might make sense. If there are plans in the works to sell the building in the near future, organizations won’t want to spend hundreds of thousands of dollars on a replacement that won’t bring any benefit. But on facilities that will be owner-occupied for the foreseeable future, such as government buildings or universities, a total roof replacement may actually cost less in the long-term when all benefits are considered. If you are doubting the integrity of your current flat roof, schedule an appointment for an initial flat roof inspection, free consultation and further analysis on the status of your current flat roof. In the case of your commercial or industrial flat roof being damaged beyond repair, you’ll want warranting, high quality and cost-effective flat roof recovery and replacement services. A good storm and water damage restoration contractor understands that in hurricanes, tornadoes and other natural disasters it may not be possible to delay repair until the homeowner reaches their insurance carrier for settlement but still will work with your insurance company to ensure proper processing of your claims. They may be listed as a preferred service provider with your insurance company making the claim payment process even easier. But, there also may be a bit too much loyalty there. When you’re deciding to work with a Storm Damage Restoration Company you should check the contractor’s experience and training and certification from the Institute of Inspection, Cleaning, and Restoration (IICRC). 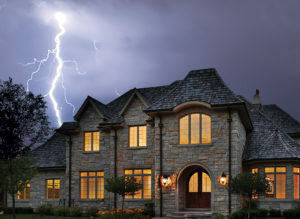 Water and storm damage restoration services most often times are needed in the aftermath of severe weather conditions. Storms may involve severe rain, snow, ice, wind, hail, or lightning, which can cause a variety of types of damage to homes and businesses. Rain, snow, and ice can lead to flooding, water damage, and mold. Wind and severe precipitation can result in structural damage to homes, garages, sheds, and other buildings. Lightning strikes can cause fires resulting in fire or smoke damage even if the fire is quickly extinguished. Prompt attention from storm remediation experts can help homeowners and business owners with clean up and repair the damage before the damage becomes severe enough to create a total loss. Several steps can help mitigate water damage, whether the damage is caused by clean water, gray water such as washing machine overflow, or black water such as raw sewage. First, all standing water including rainwater, mud, and sewage must be removed from the area to be treated by pumping or extraction. Special equipment is then used to thoroughly dry the building and its contents. Thermographic cameras as well as other moisture metering equipment is used to confirm that the area has been fully dried to prevent mold or other issues from occurring. Once the area is completely dry, the building surfaces and the contents are cleaned. In some cases, painting or more extensive remodeling such as cabinet replacement must be performed. Experienced contractors can help clients determine which possessions can be cleaned and which must be replaced. Document and media recovery services can be used to help maintain or restore critical paper documents as well as film and electronic media. If mold damage does occur, mold damage remediation contractors can help identify and eliminate the source of the moisture and provide full mold abatement services including laboratory testing, cleaning, and removal of mold spores. 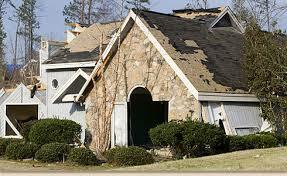 Wind damage and lightning strikes can lead to a large amount of debris as well as potential structural damage. High winds can cause roof damage, sometimes requiring a new roof. 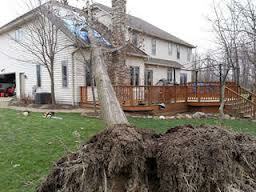 Trees can fall on homes or other buildings, causing great damage. Contractors can help clean up the debris quickly and install tarps, boards, or other temporary measures to prevent further damage. The team can help assess for any structural damage and provide or coordinate necessary repairs. Wind damage and lightning strikes can lead to a large amount of debris as well as potential structural damage. If trees fall on homes or other buildings, causing great damage. Storm damage restoration contractors can help clean up the debris quickly and install tarps, boards, or other temporary measures to prevent further damage. The team can help assess for any structural damage and provide or coordinate necessary repairs. Fires from lightning strikes or other causes can result in structural damage as well as smoke damage and water damage from the water used to extinguish the fire. 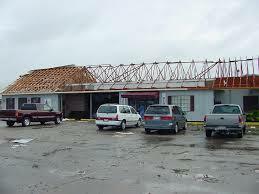 A storm damage contractor can help to assess the potential damages and take steps to minimize losses. Clothing, electronics, and other belongings can often be deodorized and restored to their original condition for much less than what it would cost to replace them. Fire damage and smoke residue can also be removed from the surfaces of the home, and structural damage can be repaired.